Happy Sunday, I hope you are enjoying a bit of crafty time over the weekend. Today sees a PanPastel UK challenge that focusses on a girly or Mother's day project. Mine is a straightforward card using DP with girly colours and embellishments. I embossed a piece of mirri-board and painted it all over with gesso and before it fully dried I rubbed some of the paint off to reveal the outlines of the butterflies and then dabbed my PPs over it. I sprayed it with fixative to make sure none of the pastel colour comes off. Another experiment in using PPs that I am pleased with. Please come take a look at the challenge blog if you haven't already seen it, you could be in with a chance of winning a trial set of PanPastels worth £11.99 from our fabulous sponsor Your Creativity Store. They have a wide range of artist materials and well worth a look. Enjoy whatever you have planned for today. Love the card and your butterfly panel is gorgeous, beautiful colours. Love this Brenda. That's a great idea with the pastels and will be giving that a go. Your embellishing on here is fabulous. Wow - this is stunning, Brenda - I love the panel you created with the pastels! Lovely Brenda I adore butterflies this is really nice . Very pretty....love the nice soft colours. Every time I see your fab work with Pan Pastels I keep thinking I have to get me some! AND SOON!!! Still - with a birthday looming I'll start dropping the hints now! This is absolutely beautiful, Brenda!!! I adore those butterflies!! This card is such a charmer! I hope that you are having a wonderful Sunday. Fantastic card in great colors. The embossed butterflies are fab. Love all the flowers. Gorgeous card, as always! Brenda. 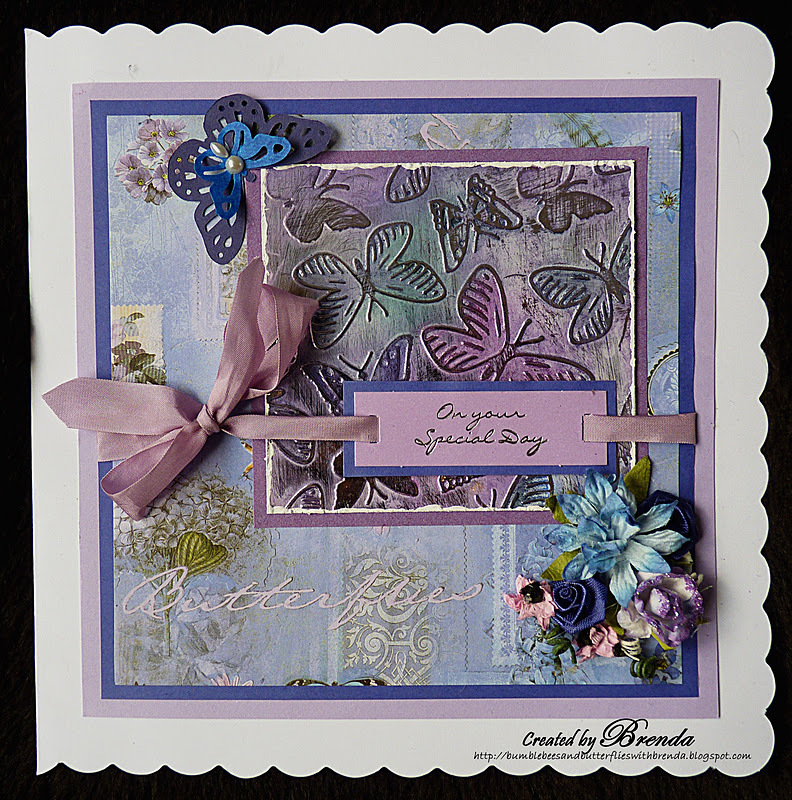 Fabulous colours Brenda - great embossing technique and a wonderful layout. Your experiments always turn out a treat! Gorgeous colors and texture, Brenda! Awww this is so gorgeous Brenda, beautiful colours. So pretty, Love the sweet colors of spring and of course the butterflies! Beautiful and springy, Brenda, what lovely techniques! I'm waiting to see that altered box with springtime colors, too . . .
Beautiful girly card, I love these perfect colours you certainly know how to use those Pan Pastels girl ! !